Just past 8.05 AM on a cold Winter morning in Melbourne. Cross my heart and hope to die…but I am not felling you no fibs when I tell you that all I have on me to ward off the winter chills is a sarong and a short sleeve singlet. I feel the cold swirling around my feet but the colder it gets the better I can think……and there is much to think about these days. A few days back I was sent this image of PKR’s “big wig” with Muhyiddin. Why the need for these PKR guys to meet with Muhyiddin? For PKR or for their own political agenda? Are they building bridges with Mahyuddin for PKR or is it to to tell us that they are are now in the driving seat of PKR….they and Wan Azizah? Where is Azmin? Azmin who? Azmin Ali lah…thats who! Let me make one thing clear. I do not know Azmin Ali…never have. These last few months I have been asked what is happening in PKR by friends and readers who think that I know what is happening in PKR. Well guys at the risk of selling myself short, I know as much about what is happening in PKR as any of you…..but all things considered, we know plenty! Divide and rule. Divide and rule at the highest level within PKR. I have already spoken about Wan Azizah in an earlier posting “Crisis in PKR”. What I have to say here is from my personal knowledge of what is going on in PKR and more relevant, from the observations of others in K Hell, in Selangor and from within PKR itself who have “talked to me about it all. They liken the situation within PKR to that which exists in Mexico…where drug cartels are run by drug lords from behind bars….long story short….Anwar Ibrahim still call the shots from inside Sungai Buloh……and by so doing undermines the authority of every one else. 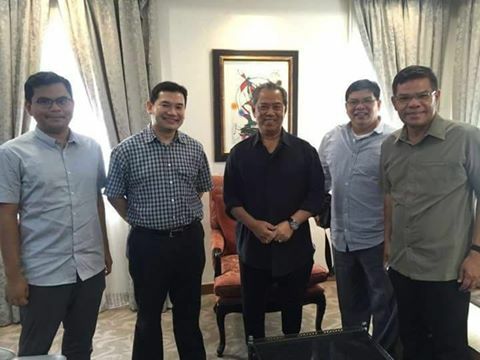 That meeting by PKR “big wigs” with Mahyuddin was surely done at Anwar’s “requests”….done at a time when everyone else is distancing themselves from Mahyuddin Yasin for reasons which will soon become clear dalam masa terdekat. It is becoming clear who is lining up behind Wan Azizah and who is not. And also becoming abundantly clear is who is standing with Azmin Ali and who is not. Now here is the ironic twist to all this….Wan Azizah takes orders from Anwar Ibrahim and so will Azmin Ali…so why would Anwar want Wan Azizah and Azmin Ali to be on opposite sides of the PKR divide? Observe that I said that Azmin Ali “will” take orders from Anwar. He does not have to take orders from Anwar Ibrahim because he has his own power base within PKR…but for now he “will” take orders from Anwar because he is loyal, to a fault, to Anwar. In all things PKR, especially in the choice of candidates to represent PKR, Anwar decides. So interested candidates lobbies Anwar and do deals with Anwar and if selected, do Anwar’s bidding…and damm PKR! Anwar appoints members to PKR’s political bureau. PKR has got the largest number of members in any party’s political bureau…UMNO included! Everything in PKR is negotiable. Everything! Anwar Ibrahim is the “go to” person to negotiate in any of these issues. No body else counts……not the President …not the Deputy president….not anybody else! PKR is Anwar’s party…but for how long? The situation in PKR today is untenable because Anwar makes it so. Anwar Ibrahim will soon run out of people in PKR who will do his bidding. …or for that matter he will run out of people anywhere he can use to do his bidding.